Red Hills was my third sprint triathlon, so I am definitely still a freshman to the sport. Before I get into what happened on race day, I must set the stage for the race day bike adventure/disaster… or the just plain bike faux pas. 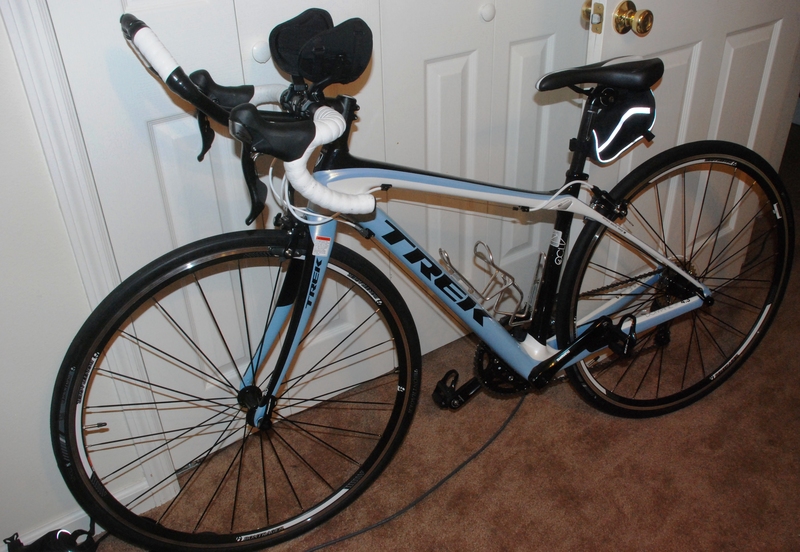 I got a new Trek Domane 4.3 bike for my birthday in January. Up until this time, I was riding a base model Trek Lexa, which was a still quite an investment for me considering I did not know if I would even like road cycling or doing triathlons. So, last summer was the first time I gave up a mountain bike and snowboard for a road bike; it still took months for me to admit I was a road cyclist. My new Trek Domane 4.3 arrived in a box in February, ready to be put together. Once assembled by a friend and local bike doctor (sounds good, doesn’t it), I was ready to take it for a spin around the neighborhood. I did a 6 mile loop around the neighborhood and then it rained, and then it rained some more, and then my kids were sick, and then I was sick…. Fast forward to two weeks before the triathlon and I started to panic as I still hadn’t put in any quality riding time on the new bike. But, boy did she look pretty sitting in my office. During this time, I logged many hours on the stationary bike at the gym and on my Trek Lexa attached to a trainer in my living room. During February I logged 132 miles of training and 150 miles of training in March. The weekend before the tri, I carved out a little time to mess around with my new bike at the local high school parking lot. My four year-old scooted alongside me on her LaLa Loopsy bike with training wheels. I now realize I was paying much more attention to her and her safety than to my positioning on my bike. I got in a 1,250 yd swim in this morning. I built up to 2,500 yds in October and have been able to maintain easy swims of 1,600 -2,500 yds since October. Today was the first time I opted for a shorter swim and focused on some sprint work: Warmed up with a 250 easy free, then 500 pull buoy, and then concentrated on swimming easy for 25 yds, then sprinted for 25 yds. I did this for 500 yards and man could I feel it in my whole body. Afterwards, I ran 3 miles, which was really supposed to be a 30 minute run or a 3 mile run, whichever came first. I ran 27:50 at an easy pace and my knee hasn’t bothered me at all (I ran 6 miles yesterday). I was doing swim/run or swim/bike bricks last year and would always get nauseaus during the run or bike. I started wearing ear plugs b/c that’s what someone told me to do, and it seemed to help. I did not wear ear plugs today and did great on the run (which I approached hesitantly). I am wondering if I was just way more fatigued from swimming before? Not real sure what the difference is now. I am hoping to run 8 miles on Monday morning and then do a couple of short runs during the week in prepartion for next Sunday’s Half Marathon.